With Smart call, text and data promo offer, one of the best options that you can avail is the ALLOUT50. A complete package that included unlimited text to all networks, tri-net calls, free FB access and data good for 3 days. For only 50 pesos, you can have all the services in one complete promo bundle that prepaid subscribers will surely love. You can use the free Facebook access to connect with your friends and love ones online. You can also use the 500MB of data to browse and surf all your favorite websites using your mobile phone anytime and anywhere. The 50 minutes calls to Smart, Sun Cellular and TNT is very useful if you have important matters to talk. 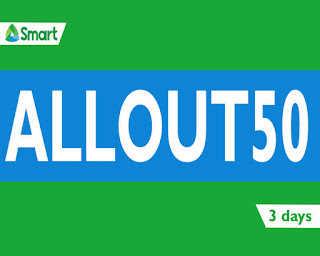 You only need 50 pesos regular load on your Smart prepaid account. You can reload at your nearest loading station or retailer to avail this promo. Just text ALLOUT50 send to 9999. Also available in ALLOUT99 for 7 days. After successfully texting the keyword, wait for the SMS notification from Smart that says your promo is ready to use and active before you starting using it. To call, just dial the 11-digit mobile number of the person you are trying to contact. Free to use FB, just turn on your mobile data then open the Facebook app installed on your phone.